Bono called it a bucket-list item. And he crossed it off Monday night as U2 played Harlem's legendary Apollo Theater for the first time. 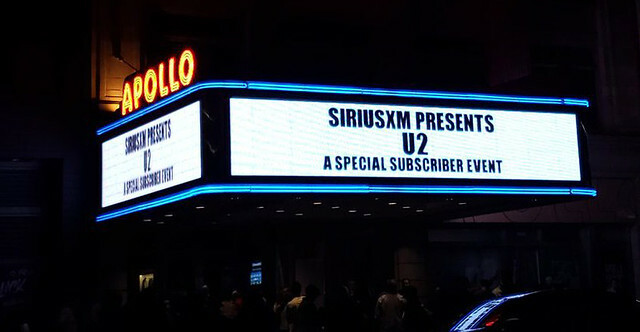 It was a special concert put on in conjunction with SiriusXM, with tickets available through several different contests on the satellite radio network, U2.com and the band's social media channels. The show began with U2 returning to its early days by playing three tracks off Boy, but the highlight of the night had to be the first encore. It featured a heavy Rattle And Hum theme with three songs from that album, plus 13 members of Sun Ra Arkestra providing accompaniment on horns. Here's U2's full Apollo Theater setlist. If you were at the show, use that link to share your photos and a review with other @U2 readers. Next up? The E+I tour resumes Wednesday in Philadelphia.